Elite 5120 Single Arm Ceiling Mount | ICWUSA.com Inc.
Monitor is suspended from the ceiling, freeing up precious wall space. 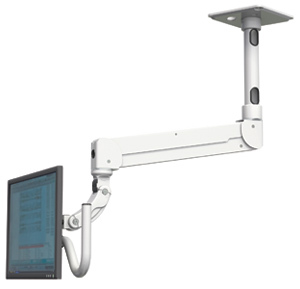 With the Elite 5120 Single Arm Ceiling Mount, your monitor can be positioned exactly where needed. Monitor handle protects the monitor and provides a firm hand-hold. This mounting arm lifts vertically, extends horizontally and rotates 360° at both the ceiling mount and at the end of the arm for complete control of viewing angle. The Elite 5120 Single Arm Ceiling Mount is counter-balanced, making it effortless to move in any direction. Durable powder coated finish stands up to rigorous disinfecting. The arm supports up to 28 lbs (12.7 kg). ICW’s ball VESA monitor attachment enables tilt, pan and rotate for fine-tuning monitor angle. This arm provides up to 21″ (53.3 cm) of vertical lift through a 90° range of motion. The horizontal adjustment range from mount to monitor is 27″ (68.6 cm). This mounting arm features ICW’s Quicklink adjuster which provides 90° of tilt at each joint with the push of a button. The Elite 5120 Single Arm Ceiling Mount attaches to the ceiling with a sturdy 8″ x 8″ (20.3 cm X 20.3 cm) ceiling plate. To customize the mounting arm to your ceiling height, extension pipes are available in lengths of 5″ (12.7 cm), 12″ (30.5 cm), 24″ (61 cm), and 36″ (91.4 cm). The Elite Single Arm Ceiling Mount is machined out of aircraft quality aluminum for strength and durability. Engineered, manufactured and hand assembled in the U.S.A. ensuring unsurpassed quality, workmanship and dependability.